Calbee launched "Black Poterich Black Pepper Flavor" on September 4, 2017. 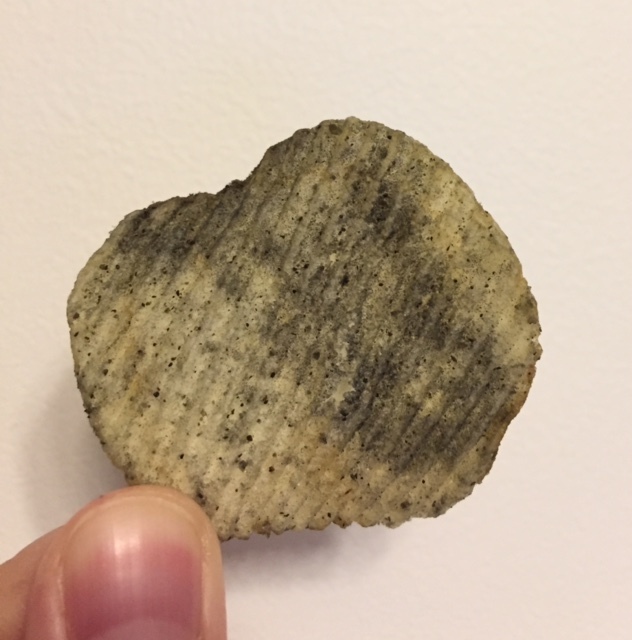 Poterich is a conbini-only line since 2006 and this series are "a bit rich potato chips" with thick sliced chips and richly seasoned. 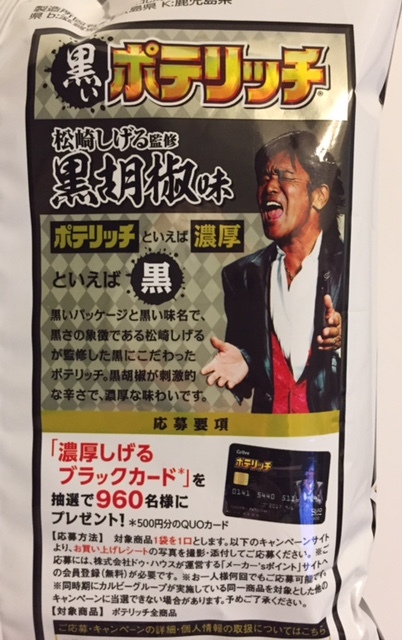 Rich = black, black = Shigeru Matsuzaki, thus, he supervised this product. Shigeru Matsuzaki is a male singer known as being very tanned, FYI. 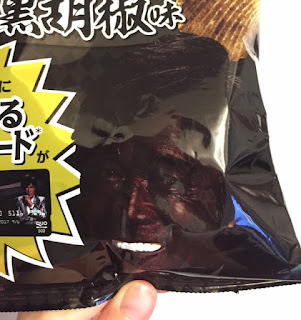 He's not as dark as this package and it's exaggerated here. 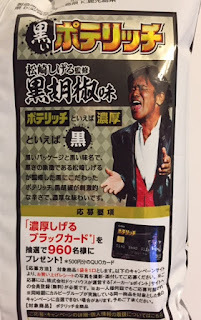 On the left bottom, it says "Noukou Shigeru Black Card" will be given to 960 customers. * Noukou (濃厚) means rich. The prize isn't a real black card but black card look-alike QUO card. The reason 960 people can win the card is that one of the ways to read the number 96 in Japanese is Kuro, meaning black. This Poterich is supervised by Mr. Shigeru Matsuzaki, a simple of blackness, with black package and black seasonings. 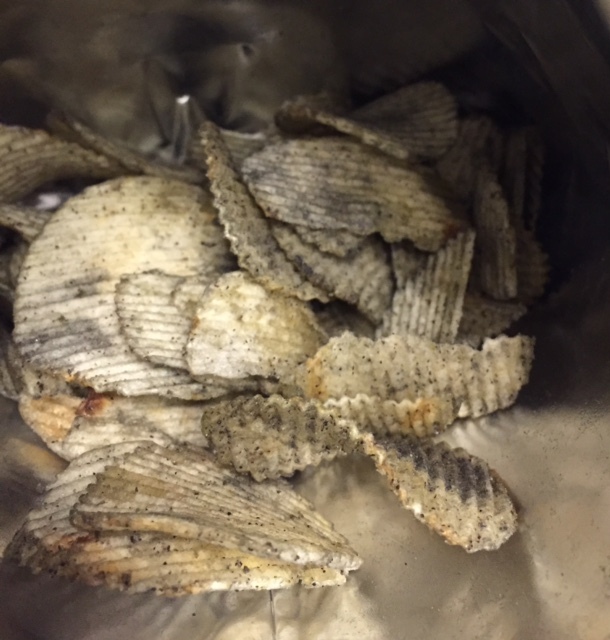 It's rich in flavor with pungent black pepper. I was surprised to see how dark the chips were. Both front and back were heavily covered with black powder and black pepper. 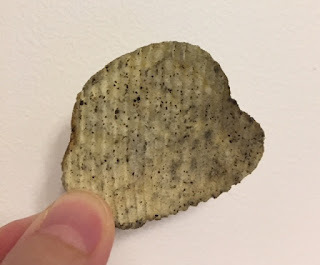 As its scent, it had spicy and deep black pepper flavor, and the rich taste went well with the thick and crunchy chips. In the ingredients, there's carbon dye and no wonder why the chips were so dark.